“Recovery is here – or just around the corner,” claim the pundits paid to sing Wall Street’s praises, echoing Herbert Hoover from Great Depression days. “Not around here,” say students being forced out of school, workers being laid off, families foreclosed and evicted. Whatever way the arrows point on tomorrow’s stock market charts, which have little to do with the grim reality under the flickering numbers, we will get worse than nothing unless and until we join with the workers and oppressed to mobilize the power to take it. ● At the City University of New York, annual tuition hikes, plus budget cuts, TAP cuts – all courtesy of Democratic governor Paterson and the Democrats who control the state legislature. Social programs wait for the ax to fall, as weeks after the deadline the budget has yet to be voted. ● At one CUNY campus after another adjunct teachers are being laid off, while classes are overfilled to the bursting point and it’s harder than ever to get the courses you need. ● At colleges throughout California, tuition has been jacked up by a whopping 33 percent. That’s not a tuition hike, it’s a program to kick students from poor and working families out of school. ● In black, Latino and immigrant New York City areas, the drive continues to close dozens of public schools and replace them with privately run “charter” schools. After angry protests by students, parents and teachers, a court decision put the latest closings on hold, but billionaire mayor Michael Bloomberg and his (anti-)school czar Joel Klein intend to steamroller ahead. ● In schools from Central Falls, Rhode Island to Kansas City, Missouri, the entire teaching force and staff have been fired. In a March 1 speech to the U.S. Chamber of Commerce, Obama praised the “strategy” of mass firings and the decision to “lay off the faculty and the staff.” His education secretary, Arne Duncan – top gun in the privatizing, union-busting crusade – talks of 300,000 teacher layoffs this year. ● Everywhere, students and graduates are sinking into massive debt, saddled with unpayable school loans, with no prospects of ever getting out from under. Student loans have reached $100 billion a year, and already last year the default rate was the highest in more than a decade. Who Can Defeat These Attacks, and How? No way around it – the fight is political. And no fight can be won without knowing who your friends and enemies are, and what is really involved. To defend public education, you have to fight the politics, parties and politicians owned and operated by those who run this society for their own profit. Pious slogans about justice and goodness are empty talk – what’s at issue here is power. As the new face of capitalist class rule, Barack Obama and the Democratic Party used slogans about “hope” and “change” to hype their program of expanding imperialist war, occupation of Haiti, mega-trillion bailouts to bankers, health “reform” prescribed by the uber-thieves of the insurance industry... The onslaught against public education is part of the package. Students need to mobilize massively to defend our right to education. But we cannot do it alone. The struggle for our right to be in class – instead of kicked to the curb by this rotten system – is a class struggle. We need to link up with the power of the working class, which keeps everything going in this society and can bring it all to a stop. To accomplish this, “student politics as usual” won’t cut it; in fact, it’s a bankrupt cover for tailing the Democratic powers that be. The truth is that defending our right to education will require struggles as convulsive as those that won open admissions at CUNY back in 1969 (a big gain for the working class, which the city’s rulers later dismantled), and mobilizations by key sectors of the multinational, multiethnic working class. It’s been over a year since we launched the slogan “Students and workers, shut the city down” – which has caught on and is now chanted at many protests – to express the need for a class-struggle mobilization, pointing towards the fight to genuinely make education a right for all though a socialist revolution. How do we get from here to there? The first steps are to tell the truth about what we’re facing, putting forward a program to defend our right to education as part of bringing students and youth into the struggle to help build a revolutionary workers party. This perspective is light years away from what’s preached by student and union bureaucrats, liberals and those groups that misuse the name “socialist” while tying students into pressure politics, opposing any clear break from the ruling class. On March 4, there were significant protests against the attack on public education. In California a number of education unions carried out work stoppages, while students occupied buildings (and at UCal Santa Cruz, an entire campus); in most other places, including New York, it consisted essentially of demonstrations. It’s good that there is protest, and as discussed in our leaflets reprinted below, Internationalist Clubs activists, together with militants from the Class Struggle Education Workers, played a key role at the Hunter College rally on March 4. In doing so, we told the truth about the Democratic Party and the need for students to look towards mobilizing workers power as the key to defending education. In contrast, official protest organizers did their best not to attack the Democrats, and in fact allied with them, giving Democratic city councilman Charles Barron a starring role at the downtown rally in front of Governor Paterson’s office. Barron preached working with Paterson, vowing to broker a meeting with him by student and faculty union leaders – which he later “accomplished.” This means tying protesters to the capitalist party that is running the government and attacking our right to education. Reformist groups go on about building a “movement” to defend education, but by itself this is just a way to blow off steam. This is the stock in trade of such groups as the International Socialist Organization (ISO) and Workers World Party, whose bloc for March 4 continues as a catch-all coalition. 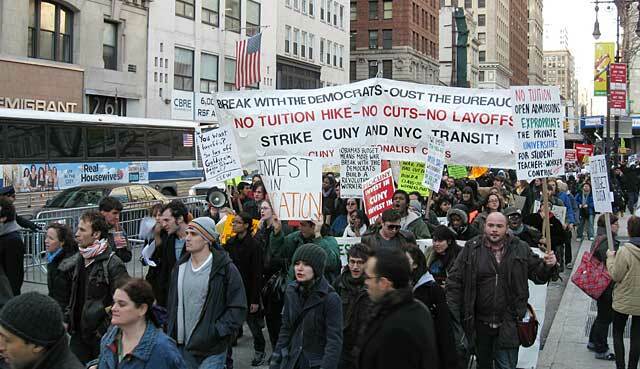 A clue to their mindset came in spring 2009 when the ISO argued for waiting to hold the main rally against the CUNY tuition hike until after the vote on the hike had been held. This makes no sense for anyone seeking to actually stop the attacks, but did fit in to the perspective of using student anger for endless “movement-building” on a reformist basis. In the aftermath of this year’s March 4 protest at Hunter, on-line discussions have multiplied, often focusing on how building occupations fit into student protests. In some circumstances, occupying a building can be a useful tactic, if it is part of mass protest, has significant outside support (particularly in light of threats of police repression), is seriously prepared and organized, and has clear objectives. (See “Inside the New School Occupation” Revolution No. 6, April 2009, or on line at http://www.internationalist.org/nyunewschooloccupations0902.html.) Much of the Internet debate, however, has consisted of grandstanding from anarchists posing under the name of “insurrectionists” (as if!) on one side, versus tidy preachments of respectability from social-democratic reformists on the other. The anarchists accuse the respectable reformists of just wanting endless empty protests – which is true. The social-democratic types (prominently the ISO) accuse the anarchists of engaging in adventurist stunts with no mass backing – also true. In this war of words between estranged cousins, neither side poses the slightest idea about mobilizing the power of the working class. Despite occasional lip service to workers as one more constituency group, both have a narrow student-centered outlook. Strikingly, both steer clear of the crucial political question of how “alliance” with Democratic politicians chains protesters to the capitalist system. Anarchists and the more open reformists share a program of class collaboration. The classic historical example – on a far bigger scale and with catastrophic results – is their joint service to the bourgeoisie in the “popular front” that led workers to terrible defeat during the Spanish Civil War.